In the late 1800’s Nettleton began producing high quality dress shoes out of their Syracuse, NY factory. Their motto was “Shoes of Worth” and they tailored their shoes to the discerning man who wanted to look and feel great in their dress shoes. Through creative advertising and an extremely well made product, their shoes were in demand from both the country’s elite while also being attractive to the successful working man. Through the years the company changed ownership and is now currently owned and operated by the Tognoni family. The Tognoni’s have a rich history in both shoemaking and artistry, and have brought that family tradition to the Nettleton brand with a dedication to making a top tier footwear product that rivals that of John Lobb and others. Currently Nettleton offers a collection of extremely high quality and attractive Goodyear welted dress shoes, both lace ups and loafers. 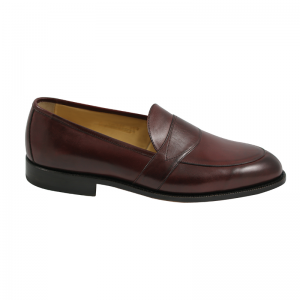 The shoes are made from the finest leathers, are carefully crafted, and are impeccably beautiful and timeless in their appearance, while catering to some modern sensibilities. At the beginning of 2015 they will be introducing their low vamp Blake Stitched collection, which showcases their style in the realm of wovens, exotics, and combination suede and patent leathers. Nettleton has a great feel for what men today want in high end luxury footwear. Their stylings, color offerings, and wide range of size and width offerings, all show that they are in tune with today’s luxury shoe shopper. An additional offering they have made available is the ‘personal pair’ program, where customers can choose any style and have it built in any color, and any leather, including Shell Cordovan, at their factory in Belgium. Contact us for details on those. Do yourself a favor and take a long look at the Nettleton collection, I believe you will be quite pleased with what they have to offer.